Are Print Books Becoming Objets d’art? 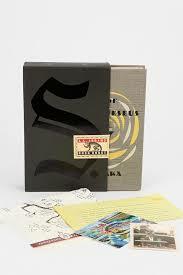 “S” by JJ Abrams and Doug Dorst could not have been easily replicated as an ebook. But at the same time, while ebooks are “stripping down to the bare-bones of what is actually book-like,” he makes the case that physical books are becoming “more sumptuous and fetishistic.” Cases in point? J.J. Abrams and Doug Dorst’s S (Mulholland Books), a novel that uses margin notes and inserted notes to expand on the centerpiece story “Ship of Theseus,” a production that Joshua Rotan, writing for The New Yorker called “The best-looking book I’ve ever seen,” as well as acclaimed modern classic, Chris Ware’s Building Stories (Random House), a box containing 14 different sized booklets, pamphlets, and bound pieces, to be read in the order the reader chooses. So tell us, are print books becoming objets ’art? Agree? Disagree? Let us know what you think in the comments.